Healing Center International is a participant in the Amazon Services LLC Associates Program, an affiliate advertising program designed to provide a means for sites to earn advertising fees by advertising and linking to Amazon.com. By using this link, HCI receives a commission from Amazon. Thank you for supporting our ministry! Join Elizabeth’s journey in her new inspirational memoir Crossroads Before Me. With openness and transparency she chronicles her early years, writing for all who have felt the anguish of a broken heart and all those searching for the path to healing and transformation. Shows how to forgive in an active, healthy way by moving through a five step process that renounces vengeance and retaliation but is not passive or self-abusive in any way. God Will Not Fail You is the inspiring life story of Samuel Doctorian, a poor Armenian boy from Jerusalem who grew up to bring dramatic revival to the Muslim world. Read the gripping account of miraculous healings, daring escapes, earth-shaking revivals, supernatural provision, and angelic visitations that will stir your faith. Samuel has led revivals in some of the countries most closed to Christianity in the world: Iraq, Syria, Egypt, Jordan and Indonesia. Every year, he travels to hundreds of countries, preaching and seeing God move supernaturally in response to the needs of his people. Samuel has preached to kings, heads of state and the British Parliament. This book reads like a modern-day version of the Book of Acts. It is for everyone who is hungry to know that miracles still happen today. Samuel’s compelling story will inspire readers to live a life of extreme faith. In Holy Ghost Reborn, the sequel to the popular and controversial Holy Ghost, Director Darren Wilson continues his journey around the world in his quest to make a movie that is completely led by the Holy Spirit. Although the scope of the film is indeed huge, with Darren filming in the middle of a massive protest in Rome, with a witch doctor in Africa, with prostitutes and the homeless in Brazil, amidst the ancient ruins of Greece, and even with a group of Navy SEALs, Holy Ghost Reborn is ultimately a film about one man's search for the Spirit of God. Have you joined a church or small group in hopes of experiencing real life change, only to be disappointed? Have you sat through inspiring sermons about what is possible when Christians gather together in mutually edifying relationships, only to recognize how cynical you have become after many failed attempts? Community may be one of the most over-promised, under-delivered aspects of the Christian life today. Individuals remain selfish and stuck in their ways. Communities become spiritually lifeless or even fall apart because we don't know how to experience transformation together. Transforming community emerges as we embrace a shared commitment to the attitudes, practices and behaviors that open us to Christ in our midst. Jesus is speaking to us here and now. Lectio divina is a practice of Scripture reading that treats the Bible not only as a text to be examined, but also as the living Word of God spoken anew to us. Experienced Bible teacher Jan Johnson gives us forty Scripture meditations, organized topically, giving us the tools we need to practice lectio divina on our own. Each meditation can be used both individually and in group settings, and includes an introductory space of quiet along with an optional preparatory exercise; the full text of a passage from Scripture with explanations of unusual or important words, and with cultural and historical background as needed; cues to help us enter the text; space to contemplate the passage, respond to God in prayer and rest in his presence and an exercise to "try on" one of the main ideas of the passage in our daily lives. Meeting God in Scripture moves us beyond merely understanding what the text meant in its original context to a direct spiritual encounter with Christ. If you were to join us in either of our homes at the end of almost any evening, or if you were to attend one of our retreats, we would invite you to do with us the process described in these pages. This book is about asking ourselves two questions: For what am I most grateful? For what am I least grateful? These questions help us identify moments of consolation and desolation. We call this process the examen. "We have given retreats in over forty countries,and we find that regardless of culture or age group, this simple process is the most helpful way for people to hear the voice of God guiding them from within. For example, should people bring us many questions ranging from, 'Should I change my job?' to 'What can help me with my depression?' We usually suggest they spend the next month focusing each day on the examen questions. Such people often return a month later having discovered from their own experience of consolation and desolation exactly what they should do more of and less of in order to resolve their problem." At the age of thirty-six, on the verge of completing a decade's worth of training as a neurosurgeon, Paul Kalanithi was diagnosed with stage IV lung cancer. One day he was a doctor treating the dying, and the next he was a patient struggling to live. And just like that, the future he and his wife had imagined evaporated. 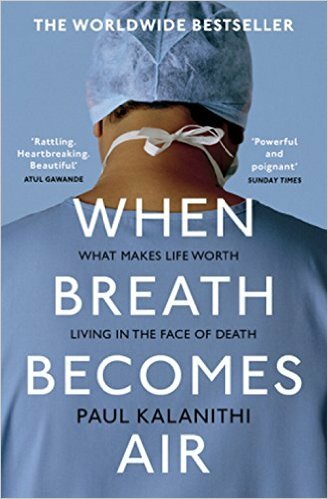 When Breath Becomes Air chronicles Kalanithi's transformation from a naïve medical student "possessed," as he wrote, "by the question of what, given that all organisms die, makes a virtuous and meaningful life" into a neurosurgeon at Stanford working in the brain, the most critical place for human identity, and finally into a patient and new father confronting his own mortality. What makes life worth living in the face of death? What do you do when the future, no longer a ladder toward your goals in life, flattens out into a perpetual present? What does it mean to have a child, to nurture a new life as another fades away? These are some of the questions Kalanithi wrestles with in this profoundly moving, exquisitely observed memoir.